Over the centuries, a lot of lore has evolved surrounding Carbolic soap. The Soap Works has had a customer tell them that they dissolve Carbolic soap shavings in hot water, then spray the soap mixture over their lawn to get rid of those root-eating grubs. Some customers hang Carbolic bars from their fruit trees or stake them around vegetable patches to discourage unwanted browsers. In many parts of the world Carbolic soap is one of the few everyday symbols of European colonial times. It has been told that surgeons still scrub with carbolic soap in remote hospitals in India. Ingredients: Sodium Tallowate, Sodium Cocoate, Glycerin, Carbolic fragrance, FD&C Red Colour. This was excellent soap. I've been looking for this kind of soap for quite a while and it is quite difficult to find. Most carbolic soaps are actually just scented that way and don't actually contain that ingredient. This is the real deal. As soon as my first bar runs out, I'm buying another pack of this so I have it on hand. Do be aware that this stuff does have an incredibly strong smell. I don't find it unpleasant myself, in fact it's a bit nostalgic for me, but it will definitely be something you can smell throughout your bathroom and possibly down the hall and I can understand why some people might not like it. It does not however stick to you when you use it. It's like any other soap. You'll smell it for a few minutes right after you use it and then it'll dissipate. Not my favorited smell, but liked the product will try different â€œflavourâ€� next time. The smell is something to get used too, but its not bad. My son loves it; his favourite soap. I don't like that it has artificial colour in it though, but will buy again. Use as a shower soap most days. Great antibacterial properties help with minor rashes,cuts and bug bites. Antibacterial properties and slight antiseptic scent make this an ideal shower soap. Helps repel insects too! Just like my Momma, I use this soap to clean cuts and scrapes that my boys get into. Also, it's great to put a bar into the linen closet as a deodorizer. It's not like the original carbolic, but I will buy it again. This soap reeks and I had to get rid of it. The smell lingered on even though I kept it in a plastic bag. Loved this bar of soap until I noticed it was made with FD&C Red, ick. Good old-fashioned clinical smelling carbolic soap. True to tradition. This soap has tried and proven anti-bacterial qualities. Nice to use occasionally. The after-smell kind of reminds me of a brand-new leather coat. The soap has a very strong chemical smell, but I kind of like it. If you're like me and everyone in the house wants to steal your nice soap, this is a great deterrent because it smells like it would burn. That being said, it gets one very clean without drying out your skin, and it helps with bug bites. The smell from this product will hit you right away - It's a strong plastic type of smell, and strong enough to fill your whole bathroom. If that doesn't bother you, then its worth giving it a shot. I am using this to help with an underarm rash that I developed from using a natural deodorant and it has helped clear that up. Have used the soap before as a general disinfectant and for skin lacerations, sometimes to take care of skin rashes (which the are many different ones) Try it, it may cure it. Smells so bad I had to throw it out. Not like I remembered it when I used to use this brand ten years ago. I think they have changed the ingredients. This bar had a very toxic scent that permeated the entire bathroom for days. Use on skin rash/medical problems. Clearing it up nicely. Excellent product. This is a good soap that works well for me. As others say it lathers well and cleans without drying the skin. It has a strong Carbolic scent, but is not a real carbolic soap. Carbolic Acid AKA Phenol has negatives so maybe this is better. this soap does smell quite a bit (a lot) but works and its one of my favourite soaps right now. lathers well, makes you super clean. one star off because of the burning plastic smell. "The Carbolic soap no longer contains carbolic acid. We use camphor, eucalyptus and rosemary essential oils now to provide similar smell and efficacy as the original recipe." I am not complaining, as it's actually QUITE efficient as a deodorant soap (have had trouble finding natural ones that truly work!). I just thought it should be brought to people's attention if they think they're buying actual carbolic acid soap (I think carbolic acid is now banned for use in cosmetics in Europe anyway). If you can stand the smell, this makes a great deodorant soap. Smells so strong that my whole bathroom smells like it now. Not sure if it's true carbolic soap though, as the ingredients only state carbolic fragrance and added colour, not actual carbolic acid. Also, not vegan! (didn't notice when I first bought it). We keep this bar out at camp, it helps with all the bug bites. We wash up at night with it and by the next day there is no more scratching. The smell is a little strong but I rather smell this soap then to stink like bug dope and smoke. I recommend this to anyone with small children and older adults. Smells awful when dry - kind of like rubber - but when wet in the shower, you can barely smell it. Lathers well and leaves you feeling really clean. My husband used carbolic soap as a child and is really glad I found this for him. He tells me it has the right smell, colour, everything! Great lathering soap. Works great, make skin soft. thanks. Has a very strong smell to it but the price is good. I have been using it for about 2 weeks now and it has helped a little with acne. I like the soap, even though it smells bad. Very happy with my purchases and I love the clean fresh smell. I have a bar handy in a wee white lacy holder and clip that to my belt when I go into the garden - keeps the bugs away! my neighbour was looking at it when we were chatting so I said it was my latest bug deterrent. He asked when did cell phones become bug deterrents - yes, it looks like a modern cell phone. Initially bought this to take camping to repel insects from the tent (worked well) but now we continue to buy it for every day. My boyfriend is a horizonal driller so he comes home very dusty and muddy, this soaps washes all that away and leaves his skin clean. Great for cleaning my face. Pretty strong so I wouldn't uses it every day, but definitely cleans the face. Combined with an astringent and moisturizer, it works well. Much better than the medicated products for acne. Ahhhh, nostalgia!! I don't know how people can stand the smell and rate it 5 stars. I bought the carbolic soap to try because of it's anti-bacterial and antiseptic properties plus reading all the reviews. I was surprised how great it cleans.My husband works with different types of woods and I find the wood has some scents I did not like so when he takes his shower and uses the soap it eliminates the smell and also sweat odor. I am not too crazy of the smell but the soap doesn't leave any residue or cause any irritation. I've started using this soap 5 years ago when my skin suffered from eczema. I'm not too crazy about the smell, but it goes away after awhile and it won't stay on your skin unlike the perfume from other soaps. This soap cleans very well without causing irritation or dryness. It doesn't leave any residue to your skin when you rinse it off. Other soaps, however, leave a film on your skin. If you're looking for a soap to clear your acne, there isn't one on the market. I've suffered from cystic acne and searched for a miracle cleanser for years. All this soap does is clean your skin without causing further irritation. It's better than those medicated cleansers for acne prone skin. Lifebuoy used to make this soap but it is no longer available from them. Glad I found it on your site. Leaves you feeling really clean and I also find after using it the mosquito's don't bother you as much. not the most pleasant smell there is, but it does clean up well ! This carbolic soap is great! It cleans very well and it does not smell too strong once you have rinsed it off. Good product. Have already reviewd it! (See below) But now that I have used it for a couple of months, I like your red carbolic soap bars! I said before that some redness comes off the soap when you use it, but that is not so; it's amazing how clean it gets one's hands! But I note that the bar tends to spilt - that likely only happens in winter, and my house IS very dry. Otherwise and excellent soap, and my skin really likes it. It does the job of a cleaning soap. Slippery last a little bit longer than ordinary soap. Strong but not very pleasant smell. No effect on acne. I used it for a bit, but the smell is insanely strong. It stinks up the whole house, so I put it in a cupboard. Now everything in that cupboard stinks like it. I am not sure if is works for acne as I stopped using it. Carbolic soap. For well over half a cen tury, I used Wrights Coal Tar soap, but then the Europeans in their wisdom banned ther use of coal tar in cosmetics. From that time the soap was not the same. My mind went back to Lifebuoy soap I remember from my youth. It's a carbolic soap. My understanding is that the European legislators got to that too and banned carbolic in cosmetic products. After much searching, I came across Well.ca's soap. It's carbolic alright, and has a very distinctive aroma. It definitely cleans the skin and many of the bugs which live there! My only criticism (and it is a mild one) is that some red colouring comes off the soap. HOWEVER, while I can't explain this, the redness doen not affect one's skin. I have acne prone skin especially on my back but since I use this soap the problem is almost gone it is by far the cheapest way to get rid of zits in the back for me.I recommend it to anyone who has acne. I have never felt so clean! Yes, the smell is a little strong at first but now I enjoy it. The smell doesn't really stay on you with proper rinsing. 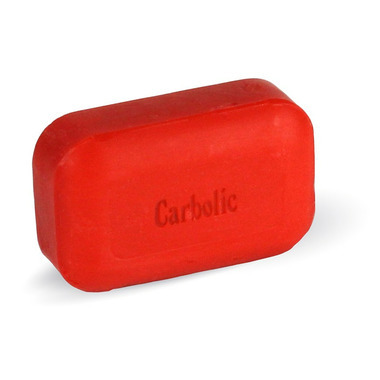 This Carbolic soap is amazing at cleaning acne prone skin. It's no miracle cure, but does a wonderful job at rinsing away built up oil and grime, and leaves you with a fresh, clean feeling that'll help clear up your skin. Don't be turned off by the strong smell, once you rinse it off, it leaves a clean smell. This product is a steal at #1.99! My husband loves this soap! This stuff smell like burnt metal. I was totally not expecting this, how does anyone shower with this? EWW! I don't like this products. I was looking for a carbolic soap for my adult acne. I was told by a family member the a carbolic soap is good for acne. So I tried this product and it left my skin very dry and did not help my acne at all. This soap leaves your skin feeling clean. It helps to eliminate some common skin problems. The smell of the soap on your skin is a little unpleasing but it is nothing perfume or scented lotion cannot cover up.